Toronto SketchFest is an annual event which features the best local comedy talent and international acts as well. The festival has grown in the last few years, landing marquee names such as Michael Ian Black, Kids in The Hall, Kurt Braunohler and last year, Kate McKinnon. This year, the festival progressed further into comedy nerdom with its headlining act, Paul Feig, who is the creator of the beloved Freaks and Geeks, director of seminal comedy films Bridesmaids and Spy, and director of A-list comedy shows such as Arrested Development and The Office (US). After all, who else but a bunch of comedy nerds would be interested in hearing a behind-the-scenes person talk? 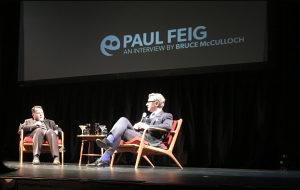 The interview started with Bruce McCullouch of Kids in the Hall fame disclosing that he and Paul Feig are best friends and how their relationship came to be. Given that personal dynamic, I expected the interview to be a light-hearted ping pong game of jokes but the conversation ended up being a fairly serious discussion about craft, character development and women in comedy. The passion that Feig has for his domain was palpable, and he was very thoughtful and descriptive in his explanations of how he blocks a scene, how swearing works as a comedic device, and the role of increasing the stakes of a storyline to make it funnier. He also described how Hollywood was reluctant to make female-centric comedies without seeing how the general public reacted to Bridesmaids first. The interview wasn’t without its funny and odd moments. McCullouch arrange for a strange skit which consisted of two young ladies blending a McDonald’s combo meal. And a bunch of entertaining clips from Feig’s history was played, the best of which showed a young Feig in a commercial for his father’s sporting goods store and another in which he won the main prize of a game show called The $25000 Pyramid. The venue also had various technical difficulties but that added to the charm of the interview. It will be great if TO Sketchfest continues to bring acts that work behind-the-scenes, But I do think that the conversation is so niche, they need have other co-headliners who are more appealing to a broader audience. Not that I’m complaining – this interview was plenty interesting and fun for this comedy nerd.